Explore the inner worlds of your Souls Blueprint. Open the door to unraveling the core issues that are holding you back from wholeness and the integration of Self. Take your muscular-skeletal system to the next level of Wellness, Stability and Balance. You will enjoy activities and movement in your body free of restriction and pain. The SOMA GEOMETRY SYSTEM™ is critical for spinal and neuromuscular heath and stability of the entire body. The C curve of the neck and low back need to be maintained in order to optimize a diversity of activities and lifestyles, on a daily basis. The Chinese Chakra System is over 10,000 years old. It consists of hand mudras and mantras that create a special sacred geometry that communes with the spiritual and physical bodies. The chakra system will assist the individual with balancing, strengthening and cleansing all seven chakras. The sounds which are generated during a session interact with the emotional body, the physical organs and the spine. Sonja also provides one-on-one sessions where she transmits sound harmonics and frequencies in the client’s energy field and chakras. These are experienced as an aura clearing, calming the nervous system as well as expanding one’s conscousness. Sonja conducts retreats, guiding you to a place of integration and wholeness by practicing several forms of yoga therapy, medicinal meditation and connecting ones soul. “Divine Mother Presence” transmissions assist the individual in accelerating the clearing of old karmic patterns that no longer serve us. 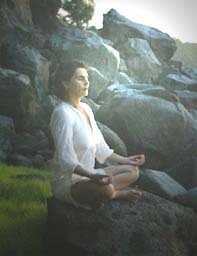 Sonja leads these retreats and workshops on Maui, the Big Island of Hawaii and the mainland. Phone sessions are also available by appointment.